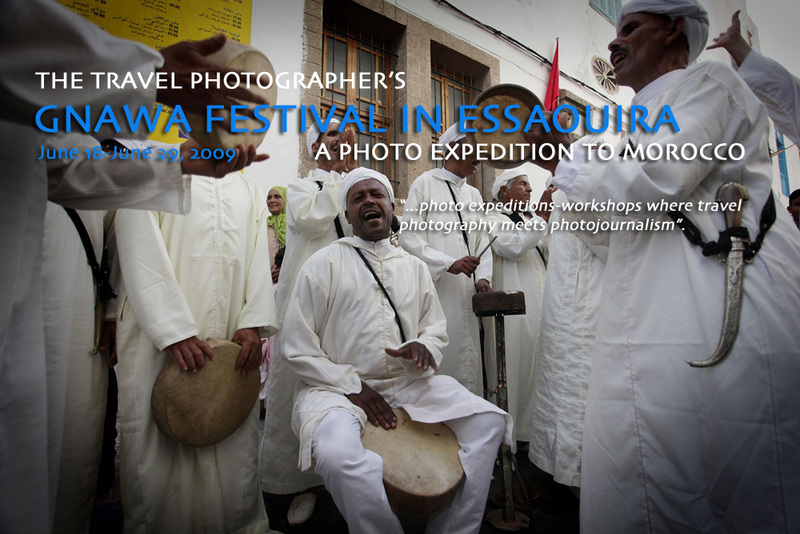 The Travel Photographer's Photo Expedition: Gnawa Festival in Essaouira! The cost of the expedition includes photo shoots, sightseeing and transfer services as per the itinerary, all accommodations, meals as per the itinerary, guides/fixers (subject to locations), a driver and vehicle for transfers from and to the airport, and land travel from Marrakesh, Ouarzazate and Essaouira. It does not include any expenses of personal nature, laundry or any beverages. The cost of international flights from the USA (or elsewhere) to and from Morocco are not included, and must be arranged so that you arrive in Morocco on 19 June, 2009. A deposit of $300 is required to secure a place on the Gnawa Festival photo expedition. This down payment is fully refundable if notice is given 60 days prior to the departure date. The balance of the cost is due 60 days prior to departure date. 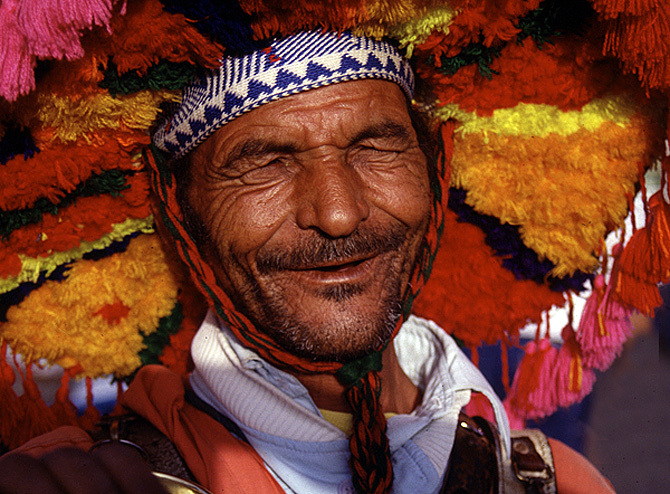 Although Essaouira is regarded as safe, the annual festival is visited by thousands of tourists, whose presence brings pickpockets and hustlers. So leave anything of value at home! Our travel agent is based in California, and specializes in Morocco-bound tours. We shall be staying in a modern 4-star hotel in Marrakech, and a riad within the walls of the old city (medina) of Essaouira. Riads are traditional Moroccan houses located inside old city districts that are several stories high, and that have an interior patio. All rooms will have private bathrooms. I assume no responsibility for accidents or injury to individuals participating in the Gnawa Festival Photo Expedition. You will be requested to read, accept and sign an agreement which releases me from any responsibility of liability in the event of any of the situations mentioned below. I cannot assume any liability whatsoever for injury, sickness, damage, death, loss, accident or delay to person or property due to an act of negligence of or default of any travel agent, hotel, carrier, restaurant, company, airline, or person rendering any of the services included in the Gnawa Festival Photo Expedition, or by act of God, act of war or terrorism. Further, no responsibilities are accepted for any damage, changes or delays due to sickness, pilferage, labor disputes, machinery breakdown, quarantine, government restraints, weather or other causes beyond my personal control. No responsibility is accepted for any additional expense, omissions and schedule changes, forced stopovers, rerouting or acts of any governments or authority. I reserve the right to decline or accept any person as a member of any tour or to cancel or alter the tour without notice. It is also the responsibility of the traveler to keep informed on deposit and payment date requirements. It is highly recommended that all individuals obtain adequate travel insurance. Essaouira, formerly known by its Portuguese name, Mogador, is beloved by Moroccans for its beauty, its near-perfect climate � even during the African summer, the ocean breeze keeps the ancient city pleasant in the day and cool at night � and its friendly inhabitants. During the Essaouira June music festival, the small town is host to 25 Moroccan Gnawa musical brotherhoods, whose exuberant, hypnotically rhythmic and joy-infused music draws an estimated 400,000 fans from Morocco and across North Africa, Europe and North America. There are also 30 other jazz fusion, rock, reggae, African, Brazilian, Afro-Cuban and hip-hop acts from more than a dozen countries performing on the stages in and around Essaouira�s walled, maze-like medina. Gnawa (or Gnaoua) is a word used to define a Moroccan music style and a Muslim religious brotherhood. The patron saint of the Gnawa is Bilal al Habashi, an Ethiopian who was the first African to convert to Islam and its first muezzin. Unlike other music festivals, the Gnawa festival's setting, in a small, friendly and almost impossibly picturesque, wind-cooled seaside city, is as magical and mesmerizing as the music. Essaouira's medina is small, and no cars are allowed within its walls. It's small enough to easily walk from end to end, and its narrow alleys are incredibly photogenic. The predominant colors of its walls are white and its arabesque doors are indigo-blue. The objectives of our Gnawa Festival Photo-Expedition are many; in the daylight hours, we will seek to photograph the daily street life of the medina, the Gnawa processions and rehearsals, while in the evenings we intend to photograph the actual gigs that make the Festival such a unique venue. All of the gigs are on stages within walking distance from each other. We will also travel to photograph in Marrakesh, the fabled pink city with Arab, Berber and African influences...the city of labyrinthine alleyways and medieval walls. We will photograph in its streets, and spend time in the Djema El-Fna, where all kinds of performers capitvate the crowds. Also on our itinerary is the desert city of Ourzazate, gateway to the desert and to Africa. The Gnawa Festival Photo-Expedition is ideal for participants interested in multimedia, and willing to create visual projects from their inventory of photographs, and learn how to control story length, intent, pace, use of music and ambient sound, narration, field recordings and interviews. Important Notice: The Gnawa Festival Photo-Expedition is limited to 10 photographers on a "first registered first in" basis. I'm unable to accept any more due to limited accommodation in the riad (hotel). We fly from New York's JFK airport to Casablanca and drive to our hotel in Marrakech (2.5 hours). We spend the late afternoon-early evening photographing in Djema El-Fna. This is an ancient main square which is populated by owners of Barbary apes, water sellers (guerrab) with traditional leather water-bags and brass cups, snake charmers, folk dentists, Chleuh dancing-boys, magicians, and peddlers of traditional medicines. We will spend the whole day in Ouarzazate photographing its street life and activities. Ouarzazate is home to the movie studio where scenes from Bertulucci's "The Sheltering Sky", Spielberg's "Gladiators", "The Last temptation of Christ", and "Lawrence of Arabia" were filmed in and around the area renowned for its Berber ceramic work and fine carpet making. A local guide will be available, along with your driver, for our excursions. Later, we will also photograph the reputed Ouarzazate dunes at sunset. Today our group will depart from Ouarzazate, retrace our steps to Marrakesh ending in Essaouira for the much anticipated Gnawa Music Festival. Today we travel on the coastal highway to Casablanca (220 miles), which we reach in the late afternoon. The rest of the day will be at your leisure. We are driven to the airport for our flight back to the United States.